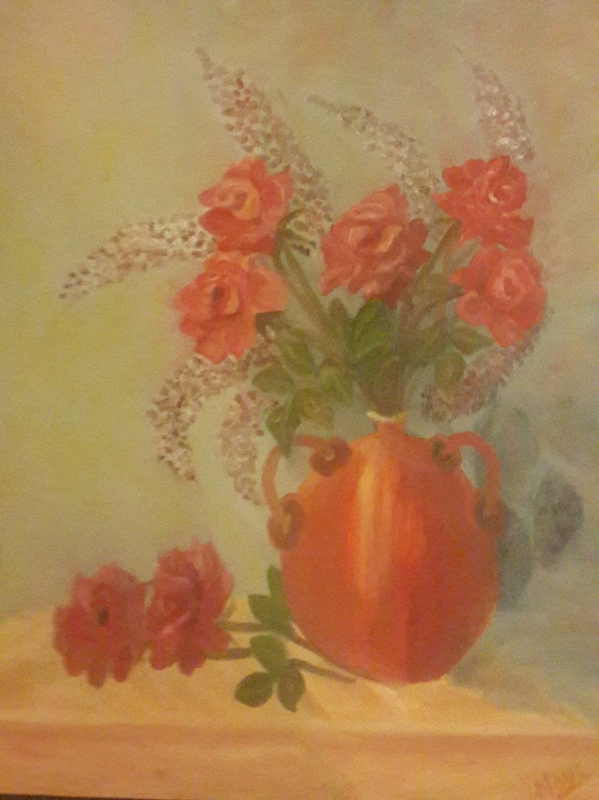 Red flowers in a vase is an original oil painting. The mirror on the wall shows the reflection of the flowers. 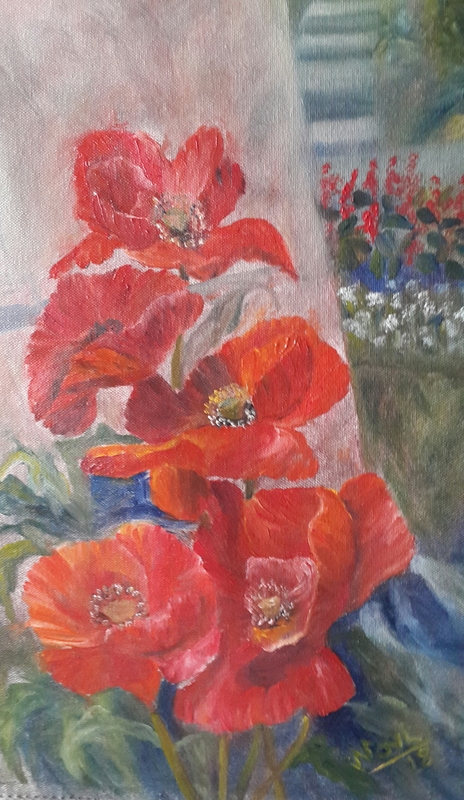 Red flowers are multi layered with some facing the front, others sideways, some hanging down and a few upright. The view outside has been painted in cool colours. Trees are visible at a distance. The folds in yellow curtain have been accentuated with the use of dark colours. The oval edge of the table is visible through the lace table cloth. The light from the window shines on the intricate lace tablecloth. The dark flooring is complementary to the white drape of the table. White flowers bloom in the potted plants. 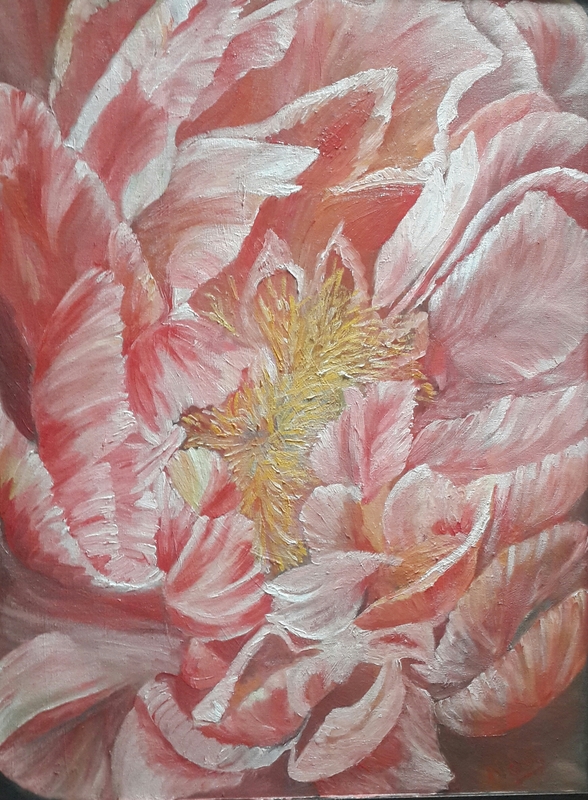 This is the story of transformation of Daffodils painting. As I painted more and more, I began to notice many things in this particular painting that needed fixing. This is how the transformation of daffodils started. The difference in the two paintings is obvious. 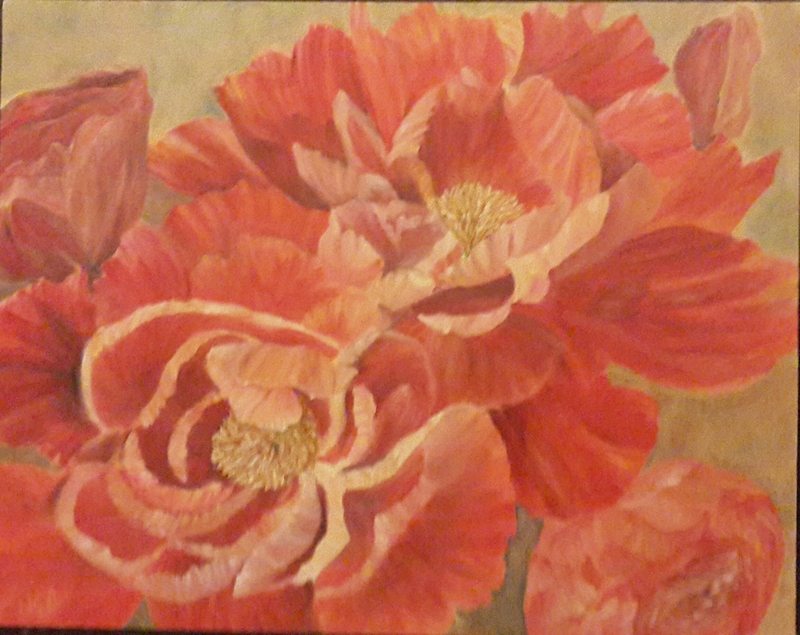 More depth was added to all the flowers in the painting. The transformed painting has very little pure white in the white daffodils. Yellows and reds were added on the light side and blues and violets were added to the whites on the darker side. Titanium white, flake white and zinc white with their different properties were used for various flowers. 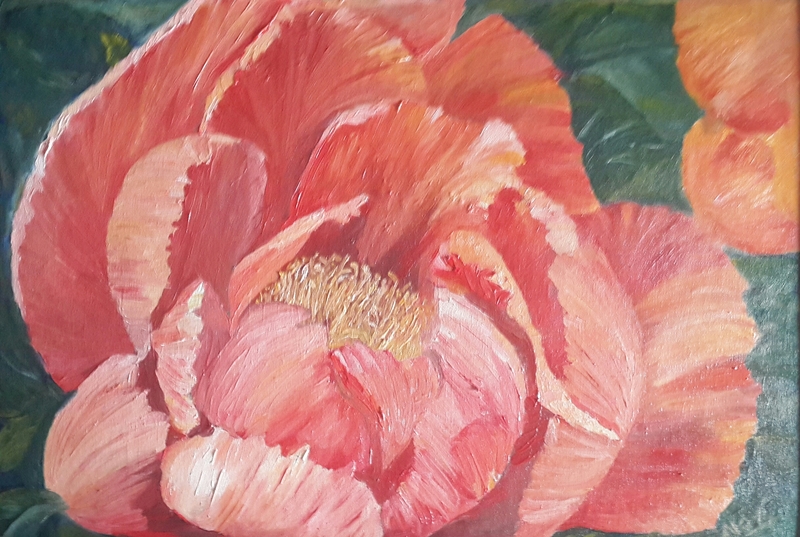 Zinc white was used on translucent petals. 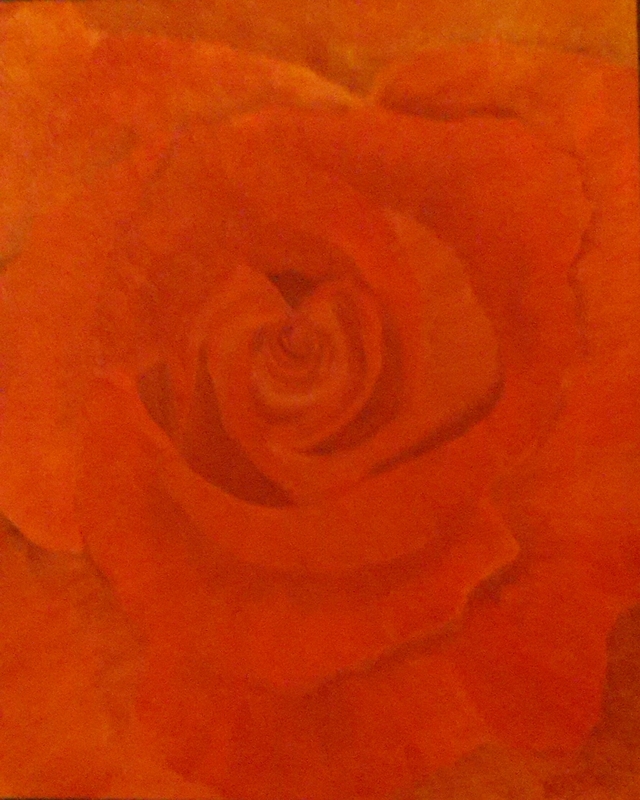 Flake white was used on the thick petals. 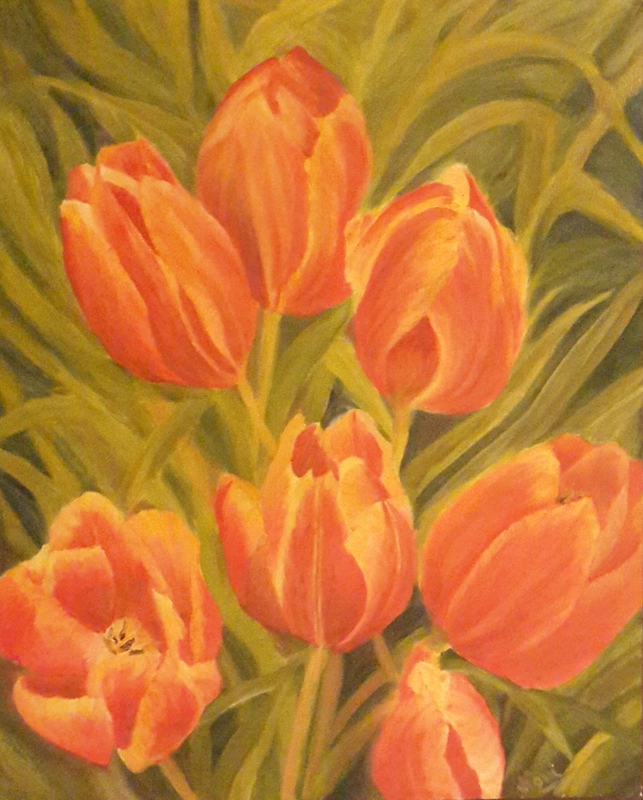 For the yellow daffodils, mixes of cadmium yellow, chrome yellow and lemon yellow with other colours were used. The edges of the petals have lighter colour which gradually get darker towards the centre. The hollows of the centres are of deeper colour with the rims having different hues on the light and shadow side. As a result, the centres of the daffodils became more prominent. 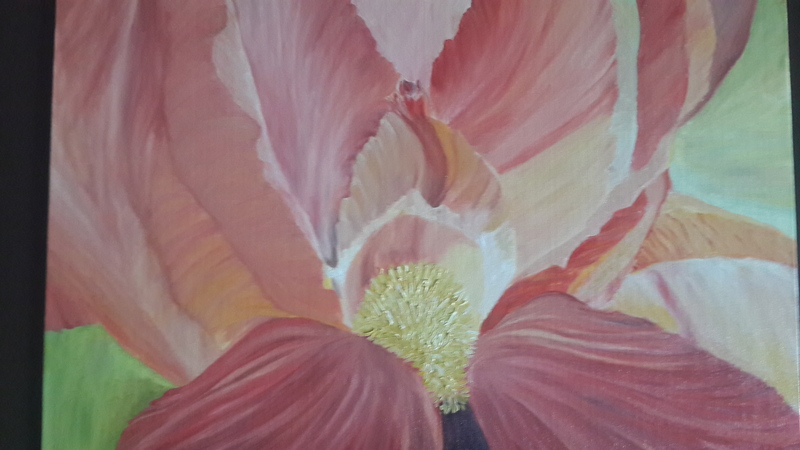 Next, more layers of petals were added to the blue flowers. The leaves and the background was touched upon. The shape of the vase was rounded. The light side was made blue and violet was added to the shadow side. Light shining on the vase was depicted with a white brushstroke on the vase. This added more roundness to the vase. Learning from this exercise was that review and reflection always leads to results. 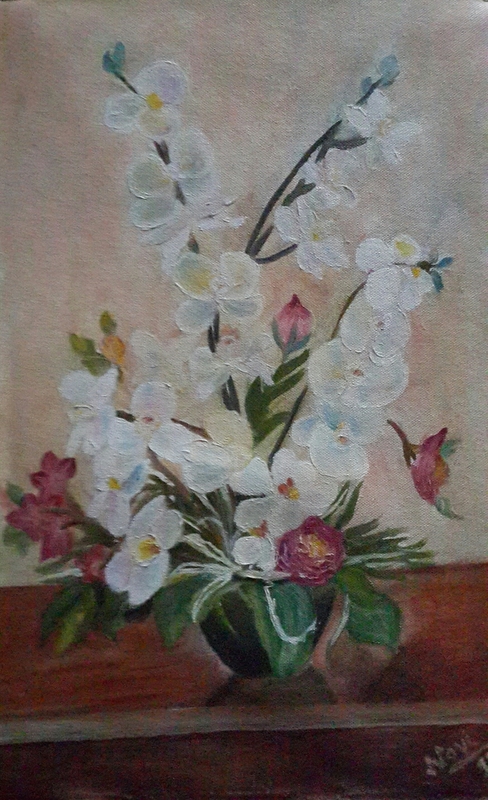 The orchids have been arranged in an appealing composition in this oil painting. The tinges of red, yellow and blue in the white orchids give them the depth and make them pop forward from the light background. The dark centres of the orchids have touches of crimson lake and cadmium yellow. The pink flowers go well with the white orchids. The dark vase on the wooden table with leaves hanging around provide a contrast to the white flowers. The shades of the wood were formed by mixing reds, blues and yellows. The light and the dark areas are depicted by mixes of these three primary colours. The wooden table formed the basis of many subsequent paintings. 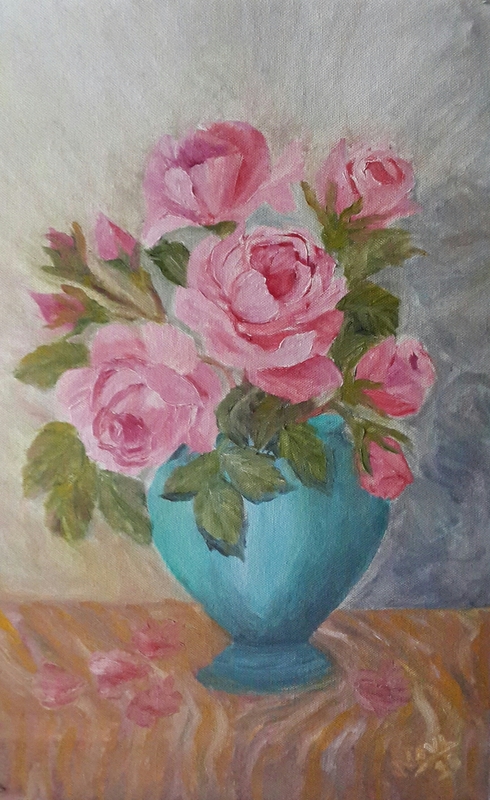 The rim of the vase is highlighted to show the light shining on it. The shadow of the vase is falling forward on the table. 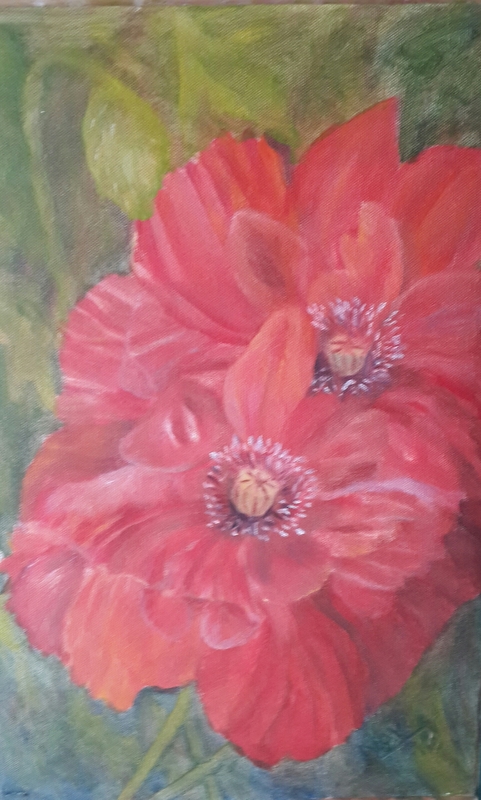 Hope you have as much joy viewing the painting as I had while creating it! 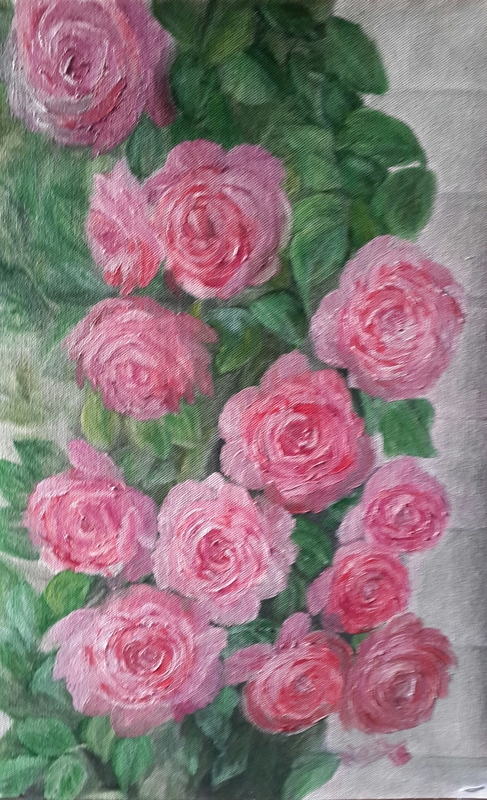 After painting roses for days together, I was looking for a different flower to paint. I came across a painting by Henri Fantin-Latour of chrysanthemums in yellow colour. I instantly liked the bright yellow flowers and the composition of the painting. I felt like painting bright yellow chrysanthemums after pale roses for weeks. That is how the decision to paint chrysanthemums was made. This is how the painting has turned out. 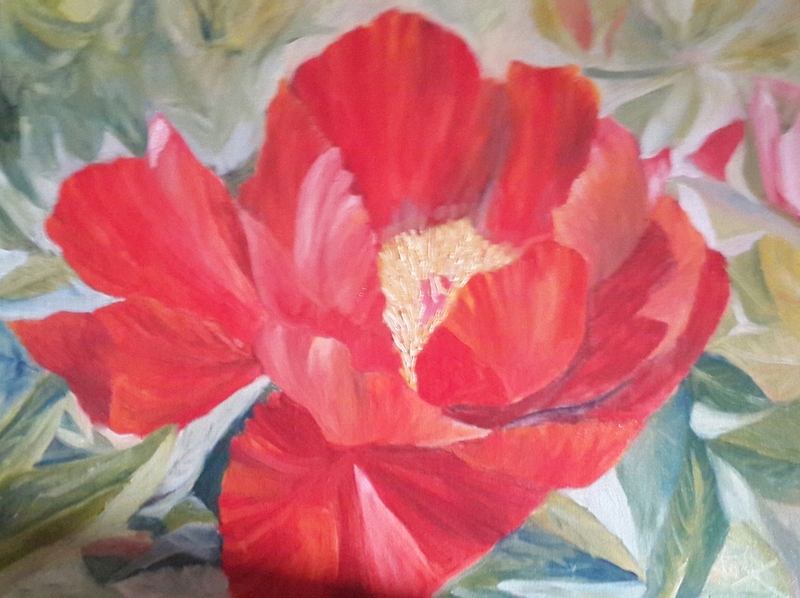 The layers of petals of the flowers took time to paint. 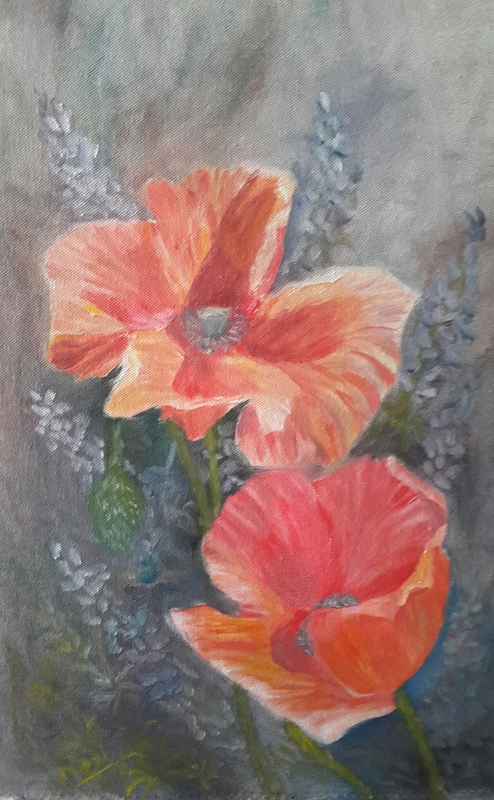 Various mixes of cadmium, lemon and ochre yellow with tinges of reds, blues and whites were used to get the various values, hues, tints, tones and shades of flowers. The more I painted, the more I appreciated the great artist’s brushstrokes and nuances in the rendition. I changed the background from the original and added more texture to it. 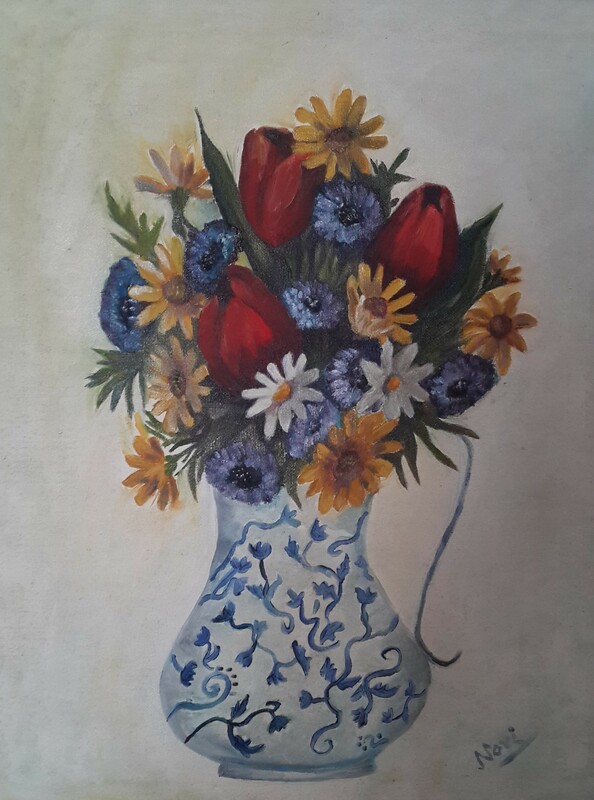 Also the blue painting on the ceramic vase is different.